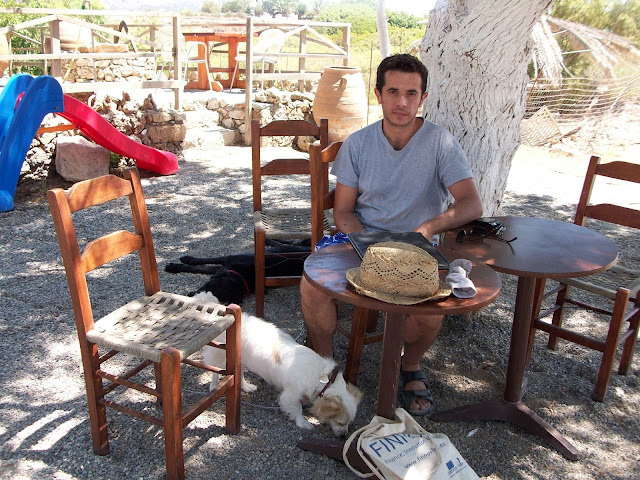 On a trip back from the Sfakia region of Chania, we returned to Heraklio via the south road, and stopped off for lunch at a place just outside of Frangokastello. 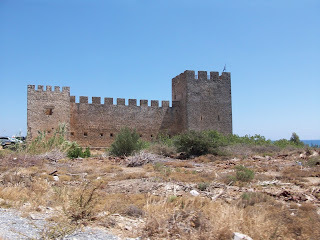 We drove by the castle, looking for a taverna that appealed to us, that would also be dog-friendly (we had two dogs with us at this time), and turned back round to return to the area a little away from the main beach, where it seemed quieter. We turned off the Hora Sfakion- Frangokastello road at a signpost pointing down to the sea which read Stavris Studios. 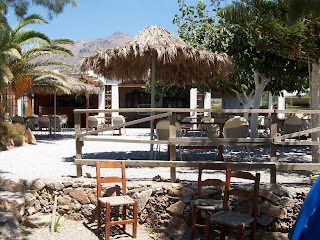 Here we found a small, relaxed taverna, with tables right on the beach if you want to sit under the shade of the tamarisk trees, near the sea. There were a few families around, presumably staying at the studios there. I have heard that this is quite a popular destination for families with young children, which may mean it is not ideal for dogs. Anyway, we kept the dogs on their leads, and there was plenty of space for us to sit a little away from the others on the beach. We took it turns to swim while the other sat with the dogs. The sea there is fantastically blue and clear; there are some rocks to snorkel around and you almost don't need a mask to be able to see fish swimming by. Prices at the taverna were very reasonable - we had quite a simple lunch (salad, sausage, fava, a beer or two) and paid less than 20 Euros between us. 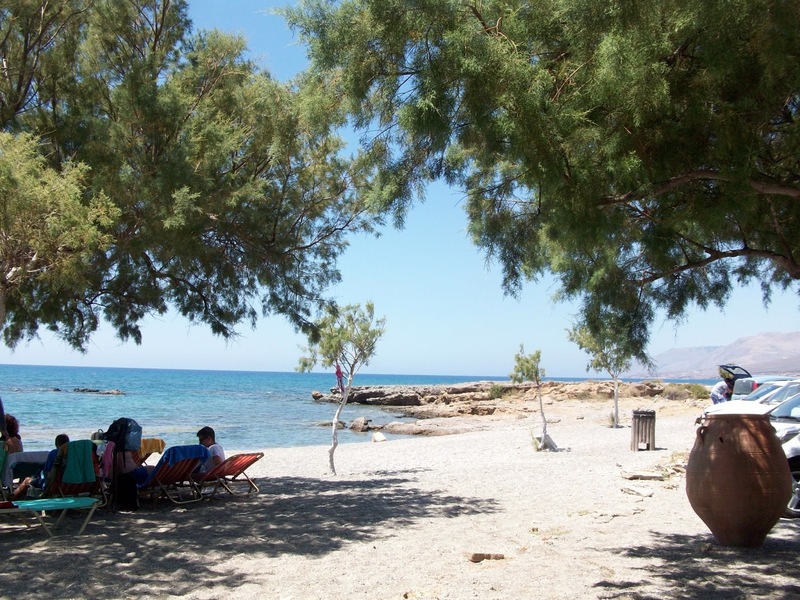 This beach is about 3 minutes drive from the Venetian castle that gives the area its name. The castle was built in the late 14th century. 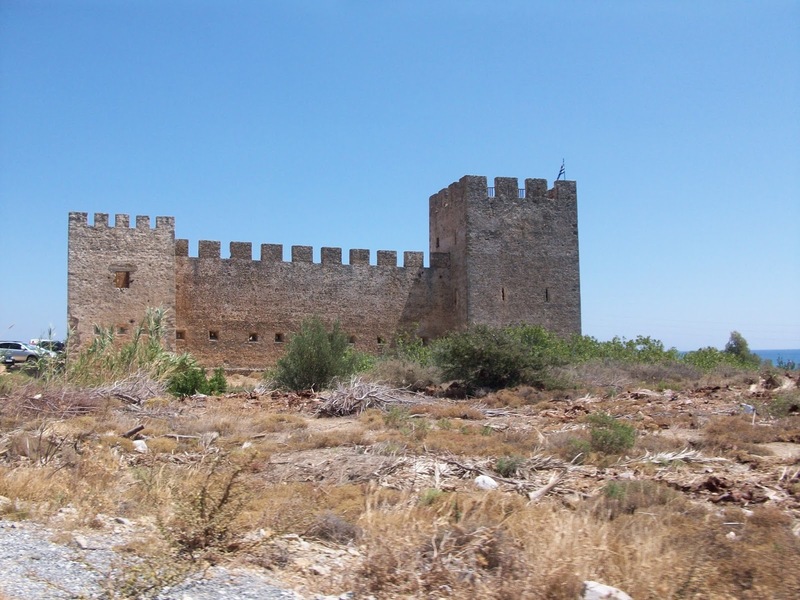 It was constructed to defend the Venetians against pirates and local rebels, and was named the Castle of St. Nikitas. The derogatory name 'Frangokastello' (Castle of the Franks, or Catholic foreigners) used by the locals eventually became adopted by the Venetians themselves. The castle has a simple, but dramatic rectangular shape, with crenellated towers at each corner. 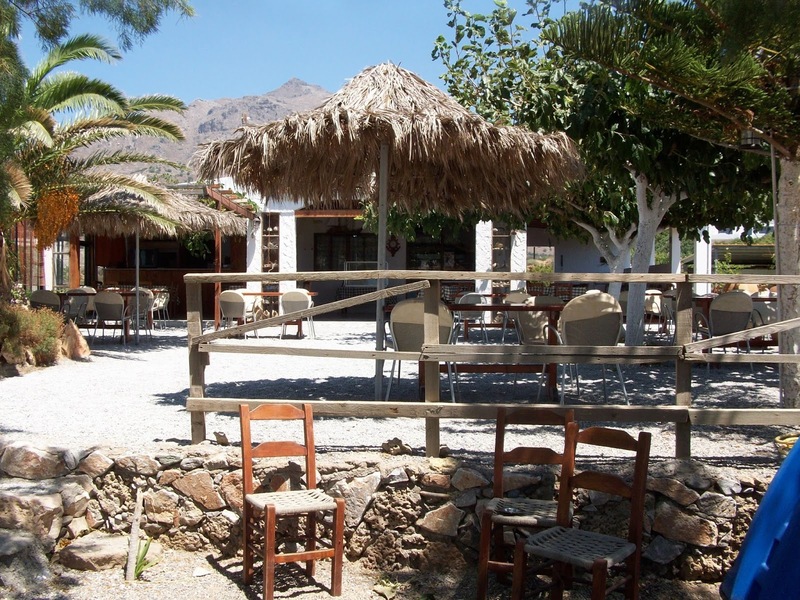 Architecturally, it is a very unusual sight for Crete, particularly as it perched against the blue seas and sand dunes of the south coast. The castle is famous for its bloody history during the long war of independence against the Ottomans. In 1828, led by Hadzi Michali Daliani, the Greeks took a stand against the Turks at Frangokastello. A massacre followed, and the martyrdom of Daliani and his soldiers entered the history of the castle and its surrounds. It is said that each year, at dawn on the 17th of May, the ghosts of those who lost their lives at Frangokastello can be seen marching out of the castle. These ghosts are called 'drossoulites', dew shadows.